Our pick for the best toddler bike is the Radio Flyer 4-in-1 Stroll ‘N Trike after comparing a large variety of toddler bikes in terms of comfort, ride-ability, safety, build quality, and value. The 4-in-1 Stroll ‘N Trike is one of the most popular trikes for toddlers nowadays, and not without reason. Even 9-month-old kids can ride safely on it thanks to all the safety features. Its level of customization is also unparalleled, allowing it to grow with your child and be their perfect companion for several years. Nowadays, kids are brought into the world and quickly become surrounded by computers, smartphones, and other mobile devices. 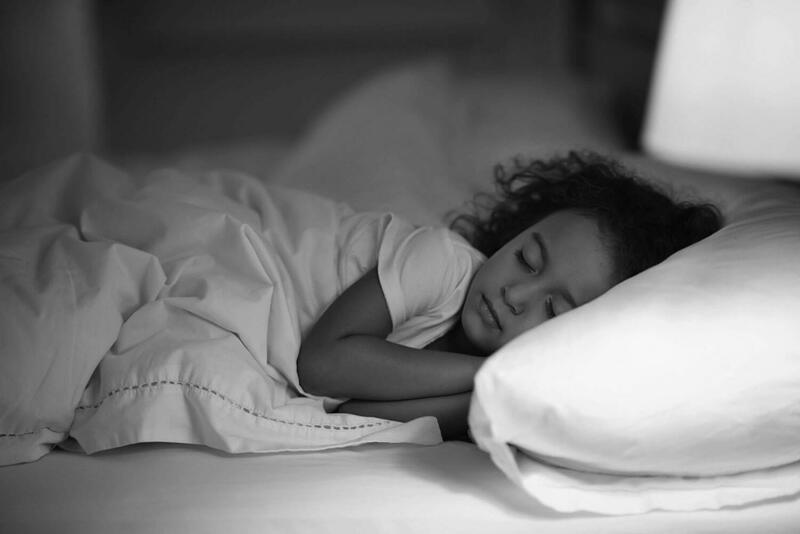 Unlike the previous generations, which grew up playing with their friends and performing outdoor activities, it is easy for toddlers to become addicted to electronic gadgets and just stay at home. However, it is healthy for kids to get out there and see the world. And what better way to encourage them to do that than to get them a bike? 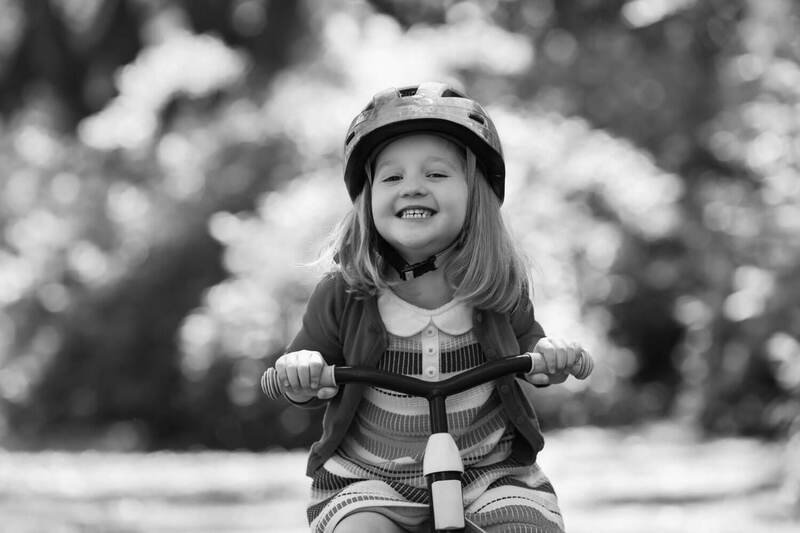 Now, you might be thinking that your child is not old enough to ride a two-wheeled bike yet. That’s why we’ve gone looking for the best toddler bike (or trike, to be more accurate). It wouldn’t be a list of kids’ toys if it didn’t feature a Fisher-Price element. The giant company usually delivers interesting products, and the Tough Trike is no exception. It comes in several different flavors, but today we’re looking at the Barbie Tough model. This trike is the most affordable option on this list, which is great if you’re on a budget. Unfortunately, this comes at a price, as the entire design is made of plastic. Still, it could be worse, as the trike does not feel cheap at all. It can, however, have some problems with traction. Despite having broad front and back wheels, the plastic has some trouble adhering to the ground, especially at higher speeds. This downside is somewhat compensated by the trike’s height, which is lower than Radio Flyer’s, so the center of gravity is closer to the ground. In terms of features, the Barbie Trike does not have a whole lot to offer. It does feature a nice storage compartment under the seat, which kids will enjoy. Little girls will also love the Barbie motif that is present in all components of this trike. This is a nice budget option in general, but compromises in some aspects. The Barbie tough trike does not have much versatility, with a plastic design and the lack of grow-with-me features. The Schwinn Roadster lives up to its name, as it is the most suited trike for long rides on the road. Let’s take a closer look at the features that make this possible. The 12-inch Trike comes in a multitude of colors, but here we’re looking at the blue one as an example. And it looks very nice, with a dark blue frame complemented by a chrome handlebar with long tassels, along with a black seat and wheels. The first thing you’ll notice when you look at the Roadster is the low-profile design. 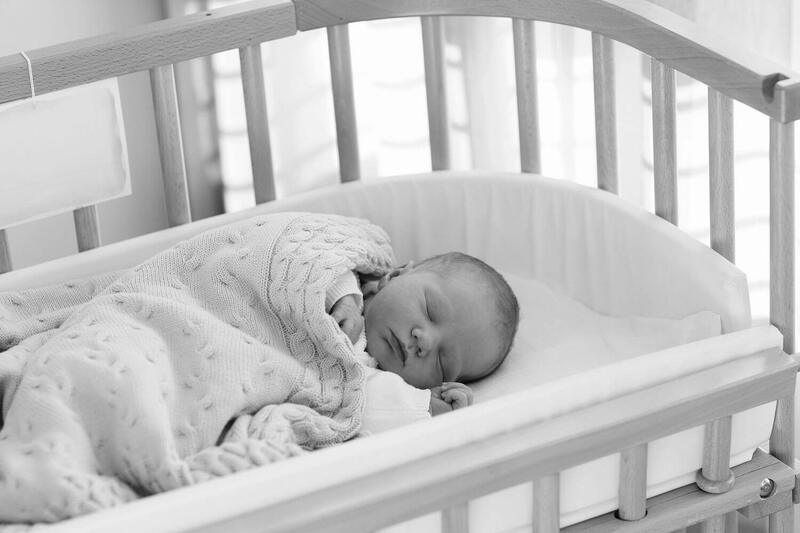 The extremely low seat is meant to low the center of gravity to increase adherence and reduce the risk of the child tipping over, which it accomplishes entirely. The whole build is rock solid, as the entire frame is made of steel. Schwinn also included an awesome detail, which is a wooden deck between the rear wheels with an engraved company logo. The sculpted seat is comfortable to sit in and can be adjusted to one of three positions, depending on the size of your child. The trike also features a bell for the toddler to ring on any occasion. The low center of gravity of the Roadster, along with the 12-inch wheels and real tires make it a joy for riding on the road. However, it does not have any extra features and is not suitable for the youngest of toddlers, as it lacks more advanced customization features as seen in the 4-in-1 Stroll ‘N Trike. 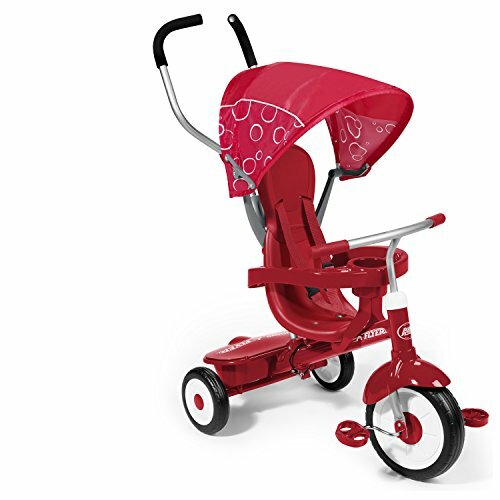 The Radio Flyer 4-in-1 is a complete, versatile, grow-with-me style trike. The first thing you’ll notice is that it is packed with features for the most varied situations. So let’s start by stripping down all the parts. We’ll begin with the removable adult handle. The handle lets you push the trike around and even steer it if you like. It’s great for taking a walk with your child. The seat has a removable top part that not only makes the back higher, but also features a safety 3-point harness to secure the toddler in place. Around the seat, there is a removable safety tray to keep the child from falling. The tray doubles as a cup holder, and it even has room for some snacks too. Above the seat, you have a removable canopy to protect the infant from the sun and those pesky UV rays. It seems that Radio Flyer really thought of all the details. They even included a storage basket between the back wheels for your child to take their favorite toys with them. The position of the seat is also adjustable. So you can place it more toward the front and move it to the back as the toddler grows. Overall, the 4-in-1 has a solid feel to it. The seat position is a bit high, which may not be ideal for traction, but it is not bad. But what’s remarkable is the level of customization. 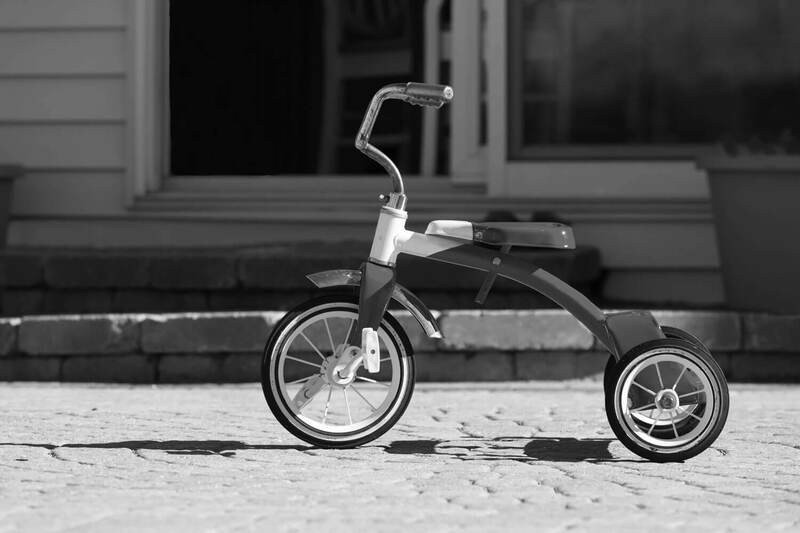 All the safety features and parts can be removed as your child grows, ultimately turning it into a classic trike. We have analyzed three different toddler bikes which in our opinion are the best available. Remarkably, each of them fulfills their purpose with distinction, and does not have any obvious design flaws. However, there is one trike that stood out from the rest. The one that does the most things right is the 4-in-1 Stroll ‘N Trike by Radio Flyer. When all components are installed, it is perfect for children as young as 9 months, as it features a safety ring, a harness and can be strolled by an adult. As the child grows, you can remove all the safety components and turn it into a classic road trike, and a pretty decent one at that. 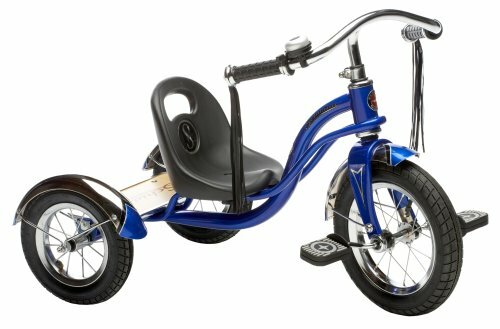 If you don’t require a grow-with-me style trike and simply want the best option for the road, then the Schwinn Roadster 12-Inch Trike is your best bet. It is really stable thanks to the low center of gravity and steel construction. There is also a good choice for little girls on this list. 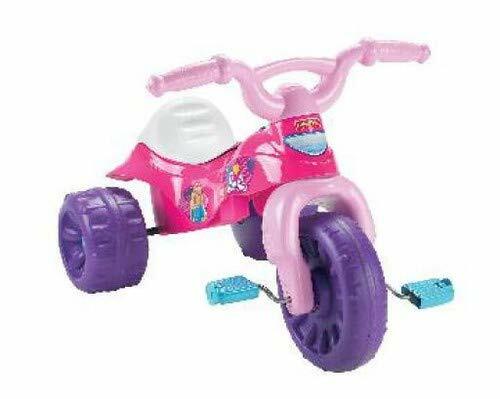 If you’re on a tight budget and don’t need a bike suitable for long rides, then go for the Fisher-Price Barbie Tough Trike.